The most challenging and the most passionately debated element in the whole gamut of film making in the dream world of Bollywood - the popularly coined nomenclature for the Mecca of Indian film industry which has now found an exalted entry, as a Noun, in the COED (Concise Oxford English Dictionary) - pertains, believe it or not, to the naamkaran - christening, the name-ceremony. The learned Jyotishacharya-astrologers-numerologists, ad-gurus along with producer, director, script writer, lyricist, musician, etc., - all sit as a team, at times over a pooja path - ritual prayer ceremony - to arrive at an auspicious name which will please the movie goers and click at the box office! The list of names Bollywood films, now aggregating into quite a few hundred thousands, would reveal an amazingly intriguing variety of titles. Once it is used as the name a ‘Mumbaiah’ film, a word(s) acquires a new avatar - remember Do Bigha Zamin, Haqiqat, Sangam, Aandhi, Anarkali, Sholay… The increasing ‘new-wave’ trend of employing longer Hindi-English mixed words as titles could be interpreted as a tell tale commentary on the fast-changing, youth-driven, linguistic scenarios. The sensitive director in Prakash Jha must have deeply thought over the recently extra value-added single word of Rashtra Bhasha, Aarakshan for its socially divisive and emotive overtones in the contemporary context in Bharat. The public controversy and cash flows at the cinema booking counters are often viewed by shrewd film makers to be directly proportionate - in terms of attracting more viewers who were otherwise indifferent. The much ado about Aarakshan could, within a month of its release, be consigned to this category. Coming to the name Aarakshan, we may note that the British rule over India, among other things, has richly contributed in the coinage of many an interesting terms and jargon of governance and administrative policies. Some of the colonial nomenclatures - rendered into Rashtra Bhasha Hindi since Independence - have undergone strange metamorphosis, assuming at times completely unforeseen explosive nuances. The word ‘reservation’ was initially used by the British rulers in the context of an administrative measure denoting the number of seats in the jobs of colonial administration exclusively earmarked for native Indians on the basis of their religious denominations. The ‘real reservation’ story, however, began with the epic struggle waged by Dr BR Ambedkar for the elementary human rights of the large numbers of groups of his people pushed for ever into the bottomless degradation of the Hindu scriptural social order of Varna Ashram Dharma, branding them as Achhut - the Untouchables. The oppression and injustice heaped since time immemorial over the so called low caste people under the scripturally scripted Hindu caste system has no parallel in human history. As the chief architect of the constitution of independent India, Ambedkar was instrumental in the legal abolition of the pugnacious system of Untouchability and introduction of ‘reservation’ of seats for the members of the historically oppressed and discriminated communities in services and legislatures of free India. The process of emancipation of the untouchables of India had indeed been made possible by the British measures to introduce process of equality before law and the electoral processes of governance. MK Gandhi was the solitary Hindu leader who could fully grasp the bitter truth of the injustice of the caste system reflecting the ugliest underbelly of the Hindu heritage and way of daily life. The hydra-headed monster of caste divides - always lurking in the sidelines of Hindu religiosity - would seem to be staging a surreptitious come back with the decline of idealistic values of freedom struggle and the disarray in the ranks of Congress Party after 1967. The implementation of the Mandal Commission Report on August 7, 1990 increasing reservations by 27% for the jobs (in addition to the existing 22.5% for Scheduled Castes / Tribes since the adoption of Constitution) by a lame duck Prime Minister VP Singh has indeed rewritten the grammar of electoral politics in India opening a Pandora’s box of gross contradictions and surcharging the social atmosphere as never before. The vote bank politics in different states has played havoc with, the broadly accepted by society, positive discrimination and affirmative action for the historically suppressed ‘untouchables’. The policies of liberal reforms with attendant ‘mantras’ of market economy for the last two decades have brought in their train acute deprivations for a larger social spectrum in India not to speak of only the so called backward classes. The frustration and indignation among the youth, particularly college / university students, against the system of quota of seats introduced in 2008 under the Mandal Commission based reservation for the other backward classes - several of them comprising groups who have historically oppressed the landless untouchable castes in the rural areas - could be well understood. The blatantly corrupt and arrogant rulers of the country must be held responsible for making a complete mess of the education system. It is in this backdrop of all pervasive corruption and crass commercialization of education - the flash point being the Supreme Court Judgment in April upholding reservation of 27% seats for the OBC students in the government funded institutions - which Prakash Jha’s latest film Aarakshan should be commented upon. Prakash Jha has a reputation as a successful film maker ‘with a point of view’. He has demonstrated courage in picking up currently controversial issues, including those plaguing his home state, Bihar; even tasting defeat in the last elections. 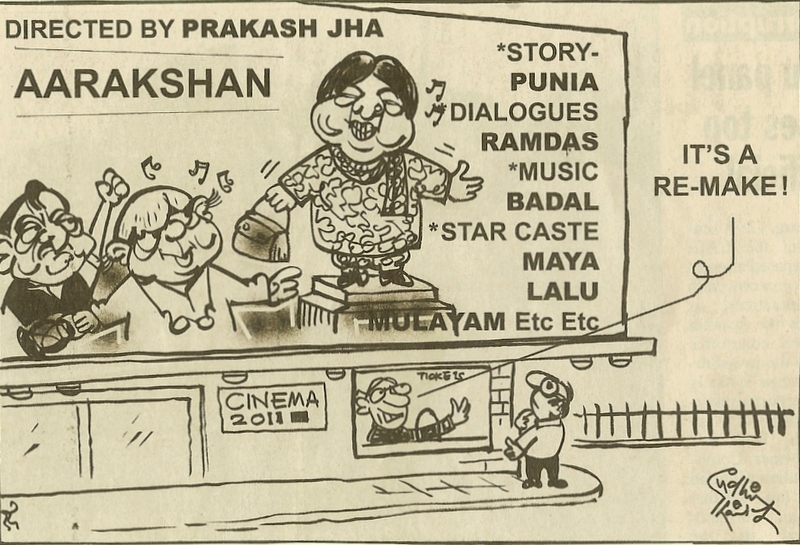 The admirers of Jha surely did look forward to Aarakshan as a film in which he would bring sense and reason to the raging debate over the larger and more complex dimensions of this highly divisive and emotive issue. 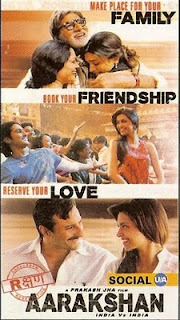 The film does open on a very promising note with a Dalit youth, Deepak Kumar ( Saif Ali Khan) facing humiliating questions about his humble origin at an interview for the post of a lecturer and thus not being considered suitable to teach in an elite institution where students belong to affluent and sophisticated background. The plot of the story, date lined 2008, revolves around Shakuntala Devi Thakral College, Bhopal. It unfolds how Deepak is beholden to his teacher-mentor Prabhakar Anand (Amitabh Bachchan) for his brilliant academic career and a job as lecturer - he is also in love with Anand’s vivacious daughter, Poorvi (Deepika Padukone). Principal Anand called ‘Guru Ji’ indeed personifies high values - academic, administrative and moral - associated with the Shakuntala Devi Thakral College. The turning point in the plot pertains to the student unrest in the wake of the Supreme Court Judgment upholding the increased quota of seats in the educational institutions for the OBC’s. Prof Mithilesh Singh (Manoj Bajpai), the Vice Principal of College, who does not share Anand’s approach on reservation and free coaching classes for the poor students, calls in the police to the college during the confrontation between the anti and pro reservation students. This action by Mithilesh Singh provokes a direct clash with Principal Anand. The turmoil of heated atmosphere of arguments over quota of seats leads altercation between Deepak and his upper caste friend, Sushant (Prateek Babbar) and also a verbal brawl with Prof Mithilesh Singh. Principal Anand, the quintessential disciplinarian, rebukes them for their unbecoming behavior in the college. He seeks apology by Deepak for his outrageous conduct when called upon to explain the matters. Deepak feels wronged; leaves the college and departs to avail scholarship to study in Cornell University. Meanwhile, Prof Mithilesh Singh who runs a flourishing private coaching business with involvement of members of management of the college conspires successfully in getting Anand removed from his job. 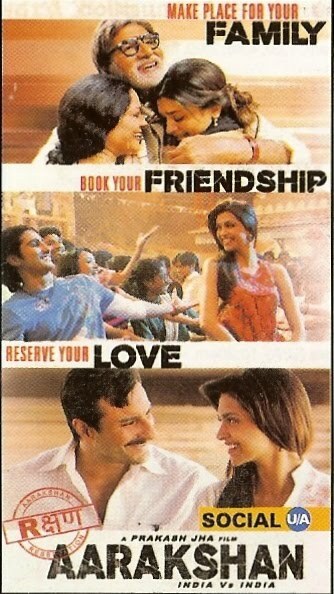 Anand has to go from pillar to post; he is even deprived of his house by the family of a friend he had helped. He, however, refuses to be cowed down and starts free coaching facilities in ramshackle cowsheds of poor but courageous Shambhoo Kaka (Yash Pal). Deepak also returns to join the struggle waged by Anand against the private coaching mafia led by Mithlesh Singh. The movie has a hastily contrived ending with Shakuntala Devi (Hema Malini) appearing on the scene like a miracle to ensure that all is well, that ends well, in a time honored ‘filmi’ formula–never mind, if that it incredibly strains the plot and story line! Aarakshan is, to tell the truth at the point of pain, is a promise belied and an opportunity wasted by Prakash Jha to initiate a dispassionate debate not only on the sensitive and divisive issue of positive discrimination in favor of still despised and discriminated Dalit/OBC communities - but also the more explosive problem of mindless commercialization of education with the state looking like a helpless by stander. The talented director, as if, loses the grip of the script midway and leaves his audience furiously bored. The film has ‘produced’ quite a few unintended heroes like PL Punia, Chairman of the moribund National Commission for Scheduled Castes, not to name many compulsive contrarians among the Dalit ranks who are ever itching for waging battles of perceived Dalit-pride, without ever having set a single positive example of an institution for their amelioration. 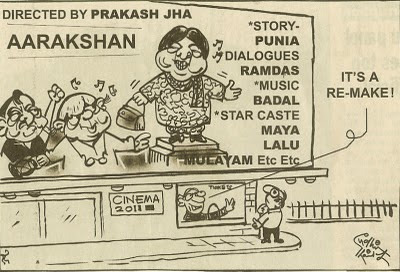 The reviewer strongly recommends that young and old of all castes must see Aarakshan…notwithstanding the most ill advised bans in a few states ruled by the self seekers who are partners in the deprivations of the lower castes, Aarakshan had netted Rs 25 Crores at the box office during the first 4 days: Prakash Jha does not deserve to be a loser for having invested Rs 42 Crores in a film which should certainly shake up the people to sit up - and Think over the twin mortal evils plaguing India: age old caste prejudices and the national system of education crumbling under the dead weight of mindless commercialization.